Are considering a private jet flight to Omaha? Let Charter Flight Group do the flying. For over 30 years, we have been taking the controls and safely conveying our private charter clients to countless flight destinations both domestically and internationally. With a vast assortment of small, medium, large, and even jumbo charter jets at your disposal, Charter Flight Group has what you need, when you need it. A couple of the secrets to the astounding success of Charter Flight Group are the service, care, personal attention, and safety that have been hallmarks of our company from the start. To ensure that every private jet flight is kept safe, CFG uses a six-step process and brings in the third-party safety auditors ARG/US PRO and Wyvern to assist. Step one involves the pilots who record all fight data for later analysis. Step two involves the flight attendants attention to any small anomaly in sound and feel as the flight is in motion; this, in addition to providing professional and caring concern for the comfort of our private charter passengers. Step three takes place on the ground, where our highly-trained flight crews regularly scour every inch of every aircraft to ensure that nothing is left to chance. Step four comes from the FAA in their regular inspections and Wyvern and ARGUS take care of the final two steps. This all adds up to safe, comfortable, and reliable private jet flights every time. Omaha has no shortage of anything, be it entertainment, business connections, or airports. With three primary airports at which to take your private jet charter, we thought we would provide a little information to help; of course, our friendly private flight charter consultants are always standing by (24/7) to assist you, but you may find this information useful in any case. If your business requires that you hurry into downtown Omaha, perhaps Eppley Airfield is the best airport for your private jet charter. It is conveniently located just north of downtown Omaha in an oxbow bend of the Missouri River…Very scenic…very convenient. However, if you will be in the city for a time or are in no rush, many prefer North Omaha Airport just north of the city alongside I-680. Another favorite, is the Council Bluffs Municipal Airport which is located right across the river in Council Bluffs, Iowa. Regardless of your needs, one of our knowledgeable private jet flight consultants can assist in helping you choose the best place to land. 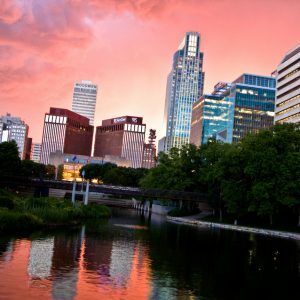 Besides watch the Mutual of Omaha’s Wild Kingdom on YouTube (which is about the only place it can now be found), there really is much to do in Omaha, Nebraska. If your private jet is for business, you will be happy to know that Omaha was originally built as the major commercial hub for the central part of the U.S. and that has not changed. In 2008, when the rest of the nation was reeling from the recession, Omaha reported unemployment rates around only 4%. This could be the result of the many and varied major corporations that reside in Omaha, including Fortune 500 firms, Mutual of Omaha, Union Pacific Railroad, and ConAgra Foods. Or it could simply be because Warren Buffet lives there. Regardless of the reason, the economy is solid in Omaha and this is always good news for business travelers. In addition, Omaha has no shortage of things to do for fun and relaxation. It simply does not matter what your mode of R & R requires, Omaha has it. Some of the more popular attractions include exploring caves, attending the “greatest show on dirt” as the NCAA College World Series has come to be known, and the Omaha Symphony. Why Charter a Private Jet Flight to Omaha with Charter Flight Group? When you charter a private jet with Charter Flight Group, we make sure you are delivered the best in quality and comfort. To attract and retain our private jet charter clients is exactly what we have been doing for over 30 years: Provide world-class service aboard the safest and most luxurious private charter jets. This is what we do and we do it better than anyone else. A better question then is…what are you waiting for? Private jet flying consultants are ready to take your call right now.